The Old Mill building, prominently located on the University of Vermont campus green overlooking the city of Burlington and Lake Champlain, has throughout its long and varied history served as a symbol of the university. UVM's original college building was constructed on the present site of Old Mill in 1802. Designed by John Johnson of Burlington, the rectangular, four-story, hip-roofed, brick structure was modeled after Nassau Hall on the campus of Princeton University. The building contained a two-story chapel, recitation rooms, library, museum, medical hall, chemical laboratory, and forty-six student dormitory rooms. Except for a brief period in 1813-14 when the college's activities were suspended during the war with Great Britain, the structure remained the sole academic building of the University until it was destroyed by fire in 1824. After the loss of the first college building, the University of Vermont began immediately to rebuild and to enlarge its home with fire protection in mind. 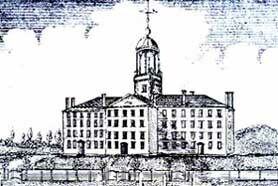 In 1825, North College and South College were constructed as dormitories with General Lafayette laying a cornerstone. Four years later, Middle College was erected between the earlier buildings, but separated by eight-foot fire breaks. 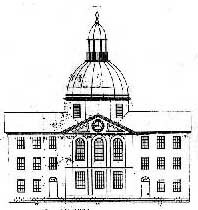 Middle College was longer and deeper than the flanking buildings and its central pavilion was topped by a gold dome. Designed and constructed by master builder, John Johnson, this Federal style brick building housed the two-story University chapel, lecture and recitation rooms, library, museum and other institutional facilities. 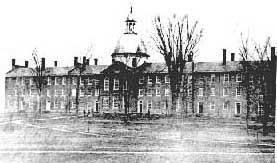 North, Middle, and South Colleges of Old Mill were joined in 1846 to form what was said to be the state's largest building. Parapeted fire walls replaced the open fire breaks, although it was still necessary to leave the building to walk from one section to another. Some thought the resulting long, narrow, brick building resembled a grist and textile mill, so UVM's main campus building came to be known as "the Mill," and eventually, "Old Mill."